However, this short video and the reaction upon it clearly shows the deteriorating aspects of ‘racial triangulation theory’ that Claire Jean Kim introduced in her writing, The Racial Triangulation of Asian Americans. According to Kim, Asian/American racialization disrupted the racial binary of Black and White in the U.S. It became a triangulation by Asian/Americans being considered ‘superior’ than Blacks but still ‘inferior’ than Whites and being fixated as ‘outsiders.’ Yet the initial negative aspect of this formation is that Asian/Americans became heavily forced upon and internalized with the Model Minority discourse. Then this ‘model-made’ Asian/American concept causes great conflicts with other non-white racialized groups, which is a tremendous obstacle that hinders us from combating racism and other oppression that Asian/Americans experience. Thus, what is the problem here and how do we solve it? I’d like to mainly interrogate the myth of Model Minority that originates from White Supremacy and U.S. Exceptionalism to critique the Asian/American isolation. As aforementioned, I see the initial problem of contemporary Asian/Americans being isolated from other racial struggles as the Model Minority discourse that’s been pushed upon the racial formation of Asian/Americans for decades. We, ‘as the model minorities,’ are represented with “diligence, discipline, strong family values, respect for authority, thriftiness, morality, self-sufficiency, and respect for education,” unlike “The Underclass” (Kim, 121) Yet, Omi and Winant argues in their writing, Racial Formation in the United States, “racial meanings pervade US society, extending from the shaping of individual racial identities to the structuring of collective political action on the terrain of the state.”(66) This theory looks at the concept of race as a social construct in which the racial categories are determined by socio-political and economic forces. Based on this, the Model Minority discourse is a construct, not actually who Asian/Americans are. Then, who created this construct? Lisa Lowe argues in her writing Immigrant Acts that the Asian/American/Immigrants are served as a “screen” that reflects the anxiety of the nation. Here, “the nation” is of course, the White America. She continues to argue that seeing Asians as “the threatening ‘yellow peril’” or as “the domesticated ‘model minority’” equally reflects the national anxieties. Lowe concludes this sentence with, “it has historically been instantiated through the state’s classification of racialized Asian immigrant identities.” (19) Therefore, it is evident now that the Model Minority Myth is invented by the state, to eliminate the national anxiety that the White America has. It is a totally discreet way of oppression that you won’t notice easily. This sly racial project on Asian/Americans didn’t just stop there. The state also compared these ‘model’ Asians with other racialized minorities, especially the black folks, to criticize how “Underclass” the black communities are. This one article on U.S. News & World Report written in 1966 titled Success Story of One Minority Group in U.S. wrote, “What you find, back of this remarkable group of Americans, is a story of adversity and prejudice that would shock those now complaining about the hardships endured by today’s Negroes.” Such an ill-intended thing to say during 60s when the fire of the Civil Rights Movements was igniting. This tendency caused chasm in between Asian/Americans and other racial groups, especially with black and brown communities, as you see in the case of LA Riots. Due to these layers of unfortunate nation-level racial projects, post-60s Asian/American communities seem to be much less engaging in resistance, in addition to the intensifying conflicts with other racialized groups. It is quite frustrating since still, there are a lot of U.S. national and international colonialist and imperialist agenda that threatens Asian/Americans in the U.S. and in their homes. Post-9/11 policies, ICE deporting undocumented immigrants, military intervention in Asian countries, and the war in Syria are just a few of so many issues are still ongoing. Asian/Americans are now in dire need to fight and struggle. Yet, the struggle needs to be radical to be continued once you realize what created the oppression. As aforementioned, it is the state, the White America itself that we need to resist, not just the Trump administration or the Republican Party. This is also why we need coalition with other racialized groups. A lot of radical PoC movements already seems to know this fact; for Indigenous struggle, they resist the American border itself and the state, for Black struggle, they resist the state violence, law enforcement, the prison industrial complex, and for Latinx struggle, they resist the border control, militarization, state repression, etc. Now us, Asian/Americans are ought to seek the way to resist the ‘honorary white’ labels and stand with these anti-racist and anti-colonialist struggles. For example, I see a factor that Asian/Americans can learn from Ferguson. The riots in Ferguson were often criticized as just violent rebellion of black people against police force after the killing of Michael Brown. But we need to look into the important relationship between peace and justice that these rioters had in their mind. In this short zine published by Crimethinc. titled What They Mean When They Say Peace: A Few Thoughts on the Riots in Ferguson, MO, the author addresses, “real peace cannot be imposed; it can only emerge as a consequence of the resolution of conflict. Hence the classic chant: no justice, no peace.” Peace is what we want to achieve, not the method when it comes to the struggle of the oppressed. In conclusion, I want to stress again that the Model Minority is a racial project of the nation that has been forced upon Asian/Americans, not actually who we are. We need to constantly resist the assimilation, the internalization of such myth, and not be afraid to resist the state schemes. 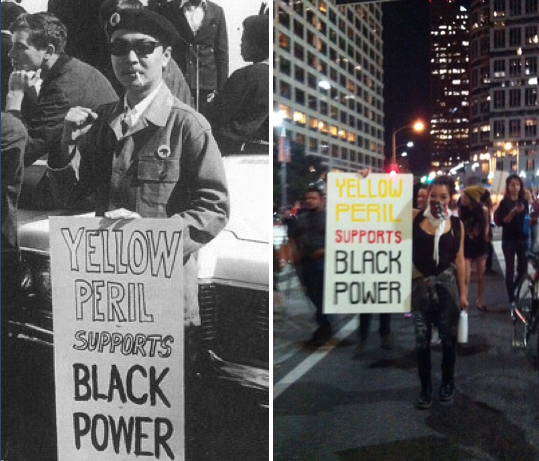 Stand in solidarity, fight with autonomy upon ourselves, and bring back the yellow peril! – Kim, Claire Jean. “The Racial Triangulation of Asian Americans.” Politics & Society, vol. 27, no. 1, 1999, pp. 105–138., doi:10.1177/0032329299027001005. – Omi, Michael, and Howard Winant. Racial Formation in the United States. Routledge, 2015. – Lowe, Lisa. Immigrant Acts: on Asian American Cultural Politics. Duke University Press, 1996. – Nguyen, Mimi Thi. The Gift of Freedom War, Debt, and Other Refugee Passages. Duke University Press, 2012. – “Success Story of One Minority Group in U.S. .” U.S. News & World Report, 26 Dec. 1966. – Crimethinc. “What They Mean When They Say Peace: A Few Thoughts on the Riots in Ferguson, MO.” Crimethinc., www.crimethinc.com.